Paper bags for the Model M-1 “Pig” Universal help this dirt-loving vacuum achieve 99.4% filtration efficiency at 0.3 microns. 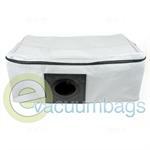 Its extra-large 12-gallon top-fill filter bag holds up to five times more debris and dirt than standard upright vacuums. This giant capacity allow this vacuum to stay on the job longer. For the Pacer 14 and 18-inch Dual-Motor Upright Vacuums Models 14 UE / 18 UE, the poly-lined two-ply paper filter bag traps the vacuumed dirt as part of Pacer’s 3-stage filtration, working together to enhance your indoor air quality. Pacer 12 and 15-inch Single-Motor Upright vacuum models 112 UE and 115 UE also make use of NSS’s two-play poly-lined filter bag construction as part of a 3-stage filtration. Optional cloth and fleece bags are available for this model. 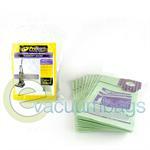 The Pacer 30 wide-area vacuum utilizes both a cloth zipper bag and an interior disposable paper filter bag. This bag is part of Pacer 30‘s more efficient air movement, a result of its compact profile that reduces the distance dirt travels from vacuum intake to the filter bag. 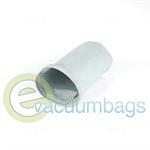 Paper bags are also available to fit the NSS Designer Dry Vacuum model. Many manufacturers underscore the importance of using their brand’s filter bags. In many cases, however, the manufacturer no longer offers the original style bag. Certain companies have stepped in to give consumers options in such situations, by making “generic” replacement bags available. These bags, while they may not be original name brand, are manufactured to high standards, meeting or usually exceeding the original manufacturer’s specifications. Some of these replacement vacuum bag companies include: Enviro-Max, Janitized, EnviroCare, DVC, Green-Klean, Micro-lined and more. In the cases where original bags are no longer available, you can be confident that we work hard to find the “next best” bag available, which is assuredly at least as good and typically even better quality than the original part. While the original may have the benefit of name recognition, the original company often manufactures several other lines of products in addition to vacuum bags and vacuum cleaners. With companies like Janitized, EnviroCare, Micro-lined, DVC, and Green-Klean, their primary focus is vacuumbags, allowing them to pay more attention to making excellent vacuum bags and giving them an edge in vacuum bag consistency and quality. Described as having “melt-blown” or “electrostatically-charged” inner liners, many of these bags are manufactured with state-of-the art materials to filter out allergens. Some bags list bio-degradability among their features to lessen their impact on the environment. Cloth Vacuum Bag for NSS Bandit Back-Vac Model Vacuum Cleaners. Disposable Paper Vacuum Bags for NSS Charger Model 2025AB and 2025DB Burnishers. Replacement Cloth Filter Vacuum Bag for NSS Pacer 30 Wide Area Commercial Vacuum Cleaner. Replacement Cloth Filter Vacuum Bag for NSS Pacer 36 Model Vacuum Cleaners. 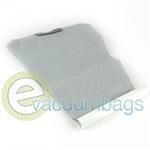 Replacement Vac Trac Collection Filter Vacuum Bag for NSS Charger Models. 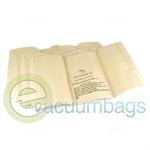 ProTeam Genuine Intercept Micro Vacuum Bags for Tornado CV30 / CV38 and NSS Pacer 112 / 115 Upright Model Vacuums.